If you have not read the first two book (Hell Divers & Hell Divers: Ghosts) in the series, stop right now and go order them. They are both fantastic reads that you will not want to put down. This review will contain SPOILERS for both of those books and you really don’t want to do that to yourself, so just stop reading this now and start at the beginning of the series. Trust me you won’t regret it. Team Raptor has been left behind on Earth by the Hive but they were able to find a new ship Deliverance to help take them to the last coordinates that Xavier “X” Rodriguez had given and hope that he is still alive after all these years. They are on a rescue mission that has zero chance of being a success but they have to hope for something and to prove to X that he was not left behind by everyone. While on the Hive Captain Jordan is losing control over the ship. The people are angry, supplies are running out and Hell Divers are in short supply. Jordan will do everything in his power to keep the ship in the air even if it means, lying, cheating and murdering to keep it that way. Team Raptor may be in danger from the nightmare creatures that now plague the Earth, but they also need to keep their eyes on the sky for danger comes from familiar places. Honestly, this is hands down my favourite sci-fi series, granted I do not read a lot of sci-fi but any time I pick up a book in this series I know I am in for a roller coaster ride and I will not want to put the book down. 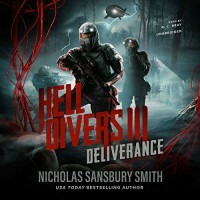 Deliverance deliveries on all the things that I want in this series; Interesting world/characters, fast pace story, action scenes, you never know who is going to make it out alive and just overall awesomeness. As stated above, there tends to be some character turn over, also known as Sanasbury has a knack for killing people off, yes that also includes some of the characters you like, so it is always nice to have some fresh blood to the books. I enjoyed that this time we get to meet some new Hell Divers in training and each of their reasons for being their and the choices they have to make. It was also interesting have more of a perspective from Captain Jordan and the choices he makes. Honestly, even though he is made out to be the bad guy, some of the reason he has about not wanting to return to Earth make sense. However, many of his actions are based upon just having the power to do things and jealousy. I really appreciated that we got some time to see what X had been up to and the progress he made while traveling as this was the bomb shell of the previous book that X was still alive and had survived somehow. X is on his way traveling to the coast but and due to Sansbury writing style (and the fact that X's part are set in the past) you never know if X is still going to be there but just the thought of finding out keeps you reading.